There are two sure ways to end up in the spotlight: 1) Learn to fly a hovercraft at HTC, and 2) Own a Neoteric hovercraft. Just ask Gary Meyers: he and his hovercraft, which he named “Neo”, are becoming nearly as famous as Bubba’s Hover! 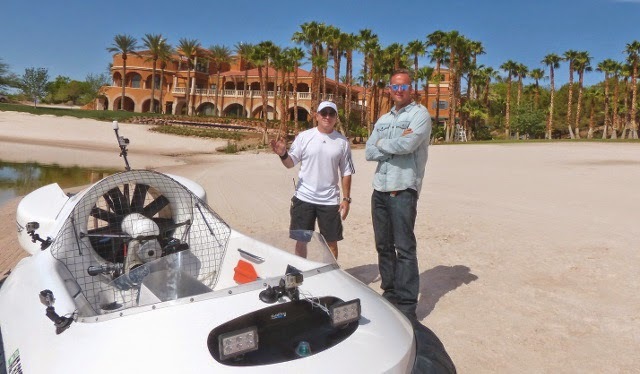 Gary Meyers (left) and Tim Shaw (right) get set for some stunt hovering on Lake Las Vegas. You’ve probably seen Gary’s custom hovercraft before and may be wondering what happened to all its artwork. NatGeo felt his craft was so striking it might be distracting! “I was asked to cover the Tek-Wrap logos and images so as to not distract viewers, so Neo was all white,” Gary explains. Enjoy a few more photos of the filming while you wait for Gary and Neo to make your jaw drop this fall on NatGeo’s None of the Above. And leave a comment below to let us know what you think and if you plan to watch the show! 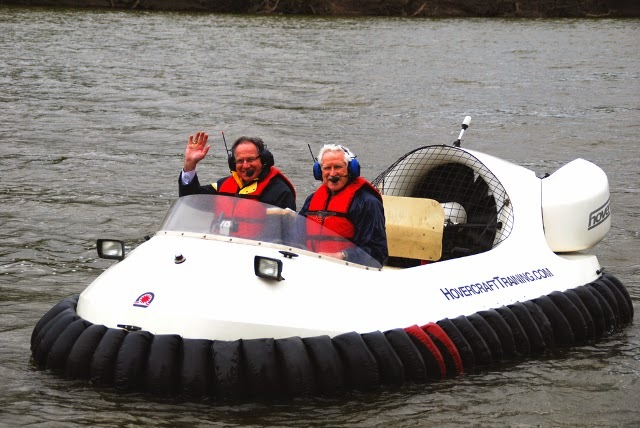 Want to join the hovercraft hall of fame? Marc Sidell of Seattle, Washington is a boater and a pilot, and he even considered flying professionally at one point. Since he lives near the Boeing factory, and because several of his friends are pilots, flying came naturally to him. Also, he lives near the San Juan Islands and “It takes awhile to get to them by boat, but with an airplane it’s much faster. And with an airplane you can fly all over the place,” he says. 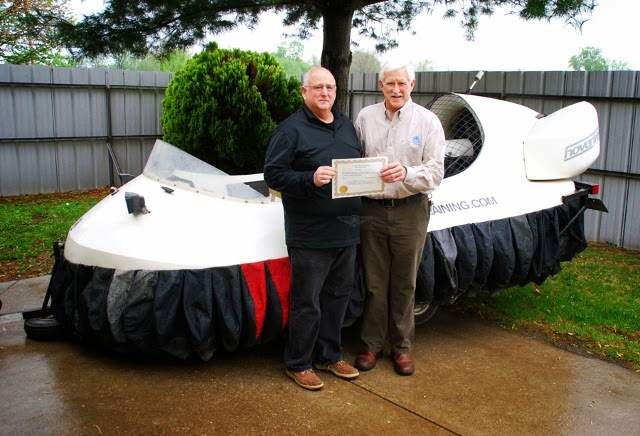 After a full day of training, Marc Sidell (left) accepts his Hovercraft Pilot Certification from Chris Fitzgerald (right). 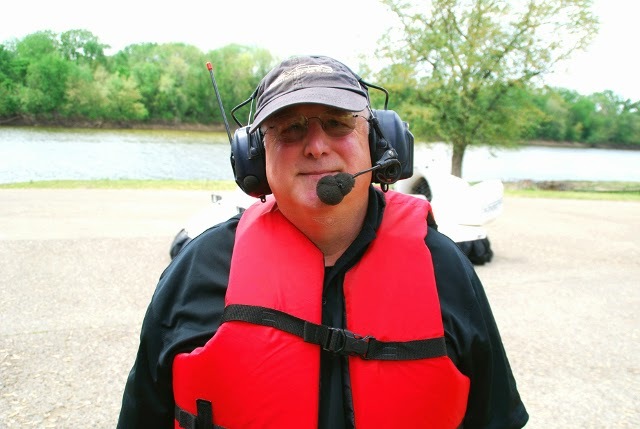 Wearing wireless headsets for constant communication with HTC Senior Instructor Chris Fitzgerald during his training session, Marc is ready for his first flight in a hovercraft at the Wabash River training site. 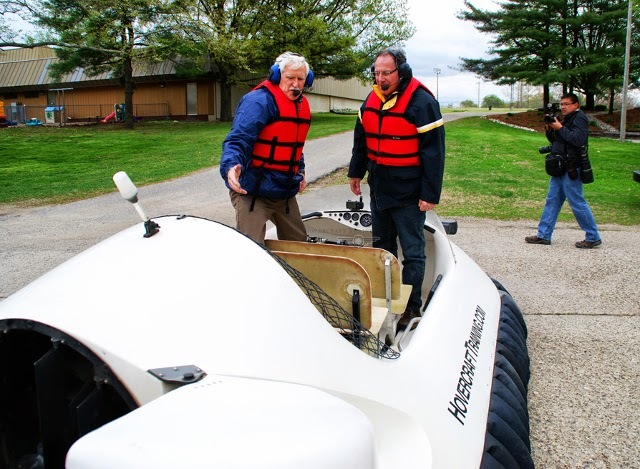 Chris Fitzgerald fully reviews the operation of all the hovercraft’s controls with Marc before launching the craft onto the river. And they’re off, with Fitzgerald in the pilot’s seat to explain maneuvers before Marc takes over the controls. 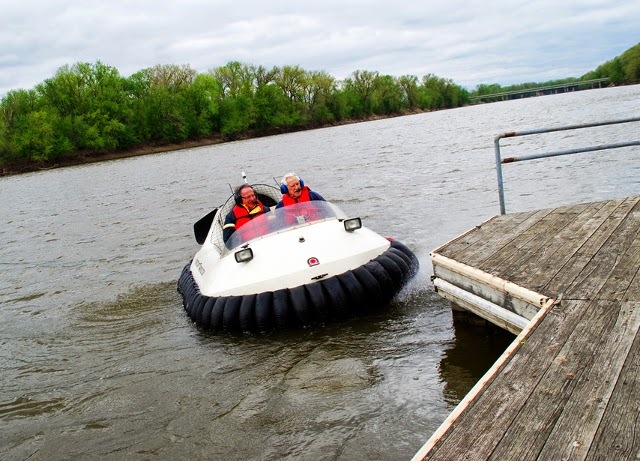 After a morning classroom session where he learned everything about hovercraft and their operation, then a flight demonstration with Chris Fitzgerald, Marc easily flies the craft down the Wabash River to practice what he’s learned. 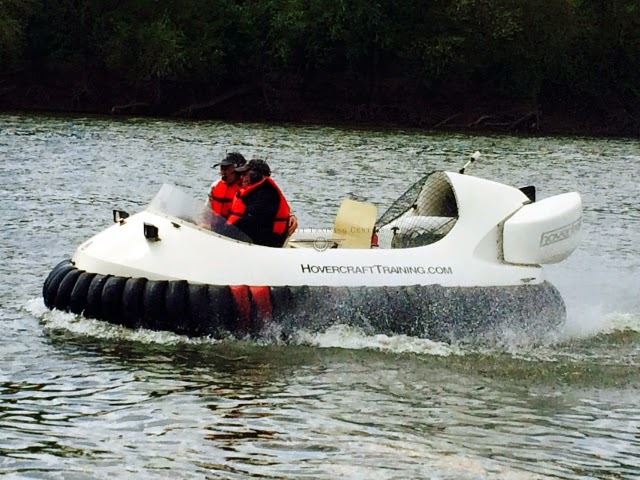 Would a hovercraft work for you? Paul DiFuccia is an experienced decision-maker. He used his accounting degree to become Vice-President of General Mills, one of the world’s largest food companies, then he became President/Chief Operating Officer of an international company based in Manhattan, New York. When he retired, he decided to move back to Erie, Pennsylvania, his hometown, where he and his wife Janice are part owners of a winery. 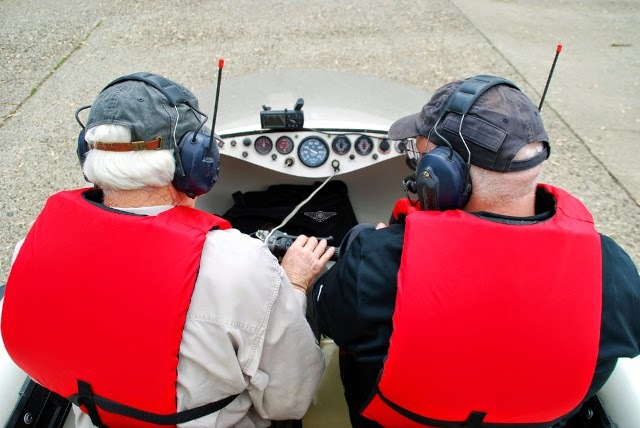 After a morning of classroom training, HTC Senior Instructor Chris Fitzgerald (left) teaches Paul to conduct a preflight inspection before his pilot training begins on the Wabash River. In the background, a Tribune-Star reporter photographs the session for an article about HTC. for his flight training session. Paul’s enjoyment of learning something new is apparent during his flight training. Even though at first Paul thought Fitzgerald “was a little crazy” to steer right into obstacles, he soon learned that flying a hovercraft is different than sailing a boat. 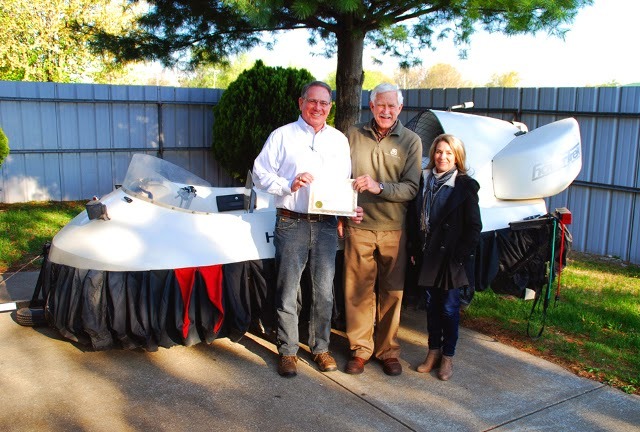 Paul DiFuccia (left) accompanied by his wife Janice (right) earns his hovercraft pilot certification from HTC Senior Instructor Chris Fitzgerald (center). 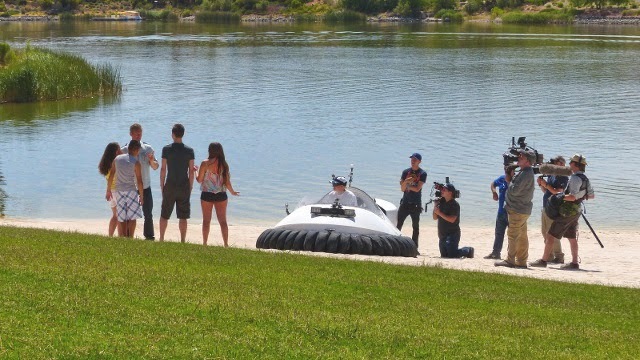 The best hovercraft video you'll ever watch! 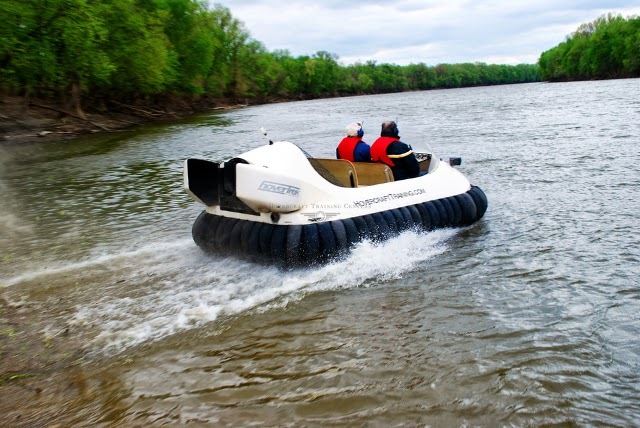 If you’ve ever had a question about hovercraft, this video is likely to answer it! And it will certainly give you an idea of the expertise behind Hovercraft Training Centers and the Neoteric hovercraft we use. A TV program broadcast to more than 44 million households across the U.S., Indiana Outdoor Adventures, aired this episode featuring HTC founder / Senior Instructor Chris Fitzgerald and Flight Instructor Steve Stafford. 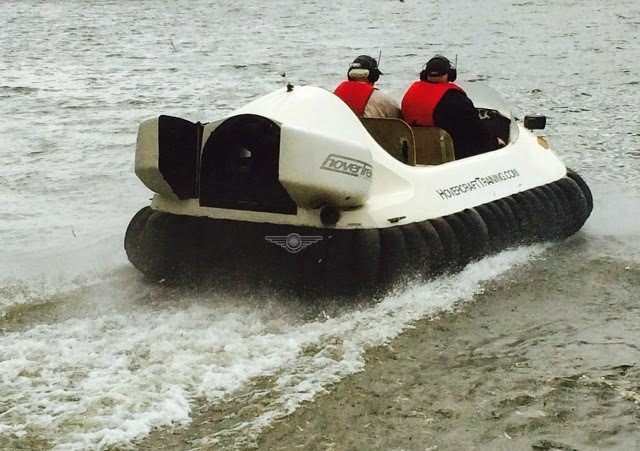 You’ll learn how and why hovercraft came about in the first place, what makes them work, what they can do, how they’re manufactured, why they’re so safe – and lots more. And you’ll see them in lots of action. We send a special thank you to the Perry Clear Creek Fire Department for their invaluable assistance in the filming of this show. Perry Clear Creek first responders and their Neoteric rescue hovercraft conducted the ice rescue demonstration in the program.